An algorithm is a basically a sequence of instructions for solving a problem or making something happen. 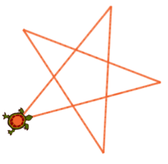 For example, a recipe, instructions for making a cup of tea or storyboard for an animation are all examples of algorithms. To make a computer program, you need to understand how computers follow instructions. Instruct students to create an algorithm from set commands to program their teacher (sandwich bot) to make a jam sandwich. After either of the two starter activities, ask students why the robot found it difficult to follow the instructions. Draw out answers such as “The instructions were too vague” or “The instructions were not specific”. Explain to students that computers (such as robots) can’t think for themselves, and that they can only follow instructions. Explain to students that we call these instructions ‘Algorithms’ and that an algorithm is a basically a sequence of instructions for solving a problem or making something happen for example, a recipe, instructions for making a cup of tea or storyboard for an animation. Click here to see examples created by students. Pick students at random to show off their artwork. Students can continue to work on their turtle art and publish their artwork when they have finished. 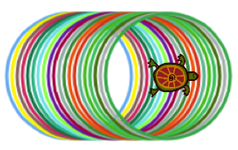 TouchDevelop "Turtle Power" lesson is licenced under a Creative Commons Attribution 4.0 International License.